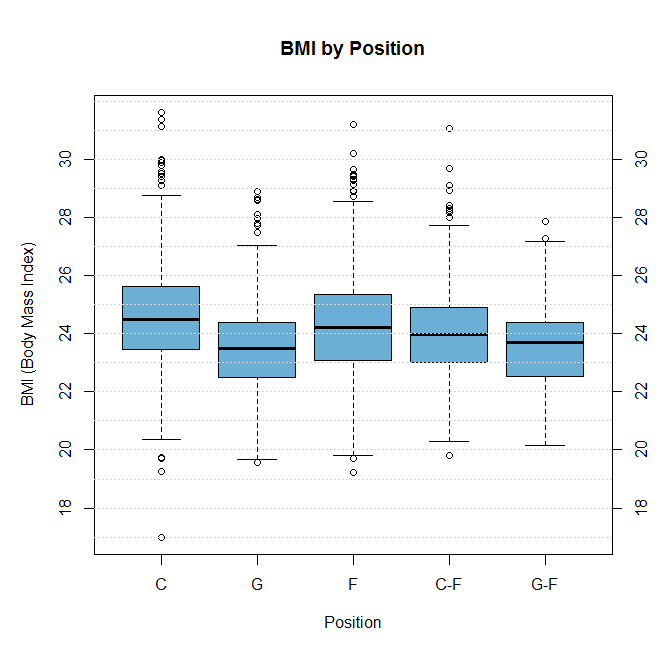 Basketball Data Part III – BMI: Does it Matter? For those of you who are just joining us, please refer back to the previous two posts referencing scraping XML data and length of NBA career by position. 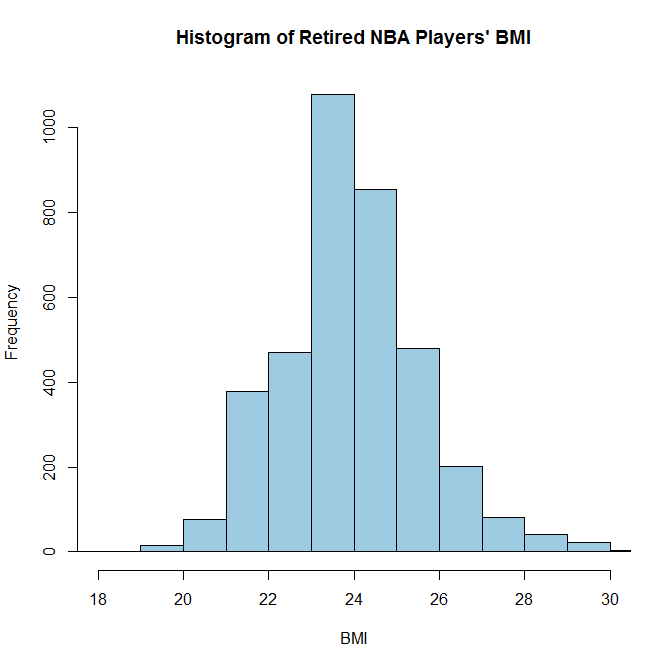 The next idea I wanted to explore was whether BMI had any effect on the length of NBA careers. Originally, I had expected centers to have relatively short careers (based on the premise that ridiculous height/weight > shorter careers). In the previous post, I find that centers have normal careers, even longer than forwards on average. So now I want to see if larger players in general have shorter careers. Do those players with higher BMIs last fewer years in the NBA? As one would expect, centers have the highest BMI, followed by forwards, followed by guards. Dual position G-Fs have BMIs between guards and forwards (as expected), but dual position C-Fs average lower BMIs than centers or forwards. 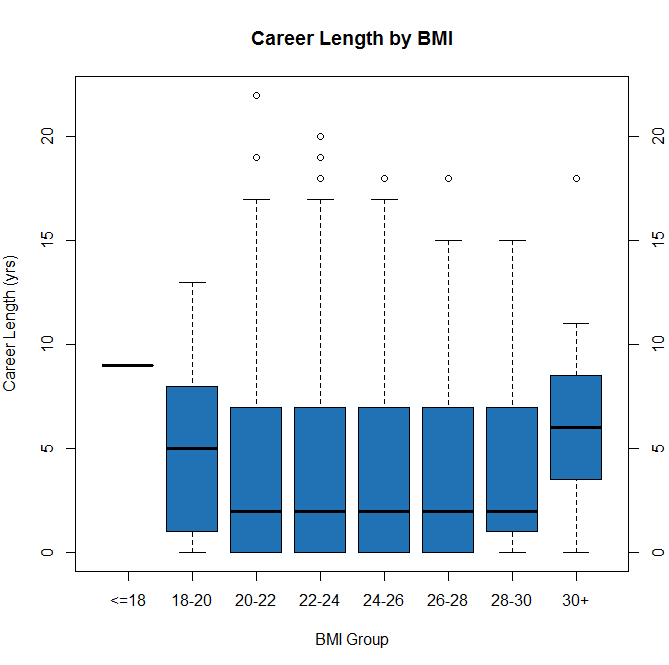 It doesn’t look like there is much relationship between BMI and career length. 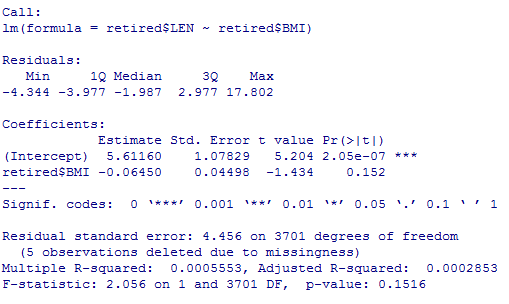 I ran a simple linear regression model and confirmed that BMI is not a statistically significant predictor of career length. It does appear that outliers on both edges of the BMI distribution do have longer careers. 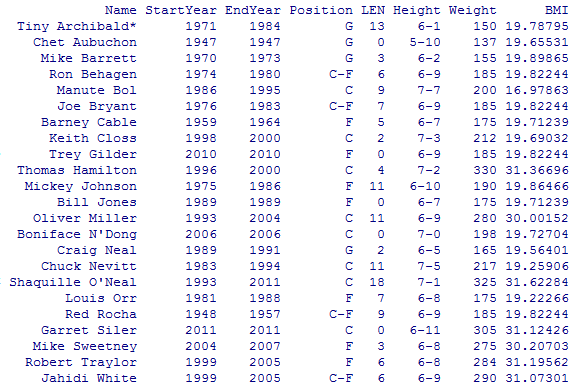 These sample sizes are quite small, but my theory is that these players were so exceptional that they made it to the NBA despite their unusual body types (too big and too small). Their high level of skill led to longer than average careers. To leave a comment for the author, please follow the link and comment on their blog: Analyst At Large » R.